When a teacher covers a subject frequently and thoughtfully their "script" becomes well honed. They learn what is necessary to include and what can be left out. Where an anecdote by example is helpful or superfluous...even if it is a ripping good yarn. Their teaching starts to look more like poetry and less like a novel. Every word counts. And when this experienced, well thought out teacher distils their script into a book - and they're in possession of good writing skills - you know you are in possession of gold. 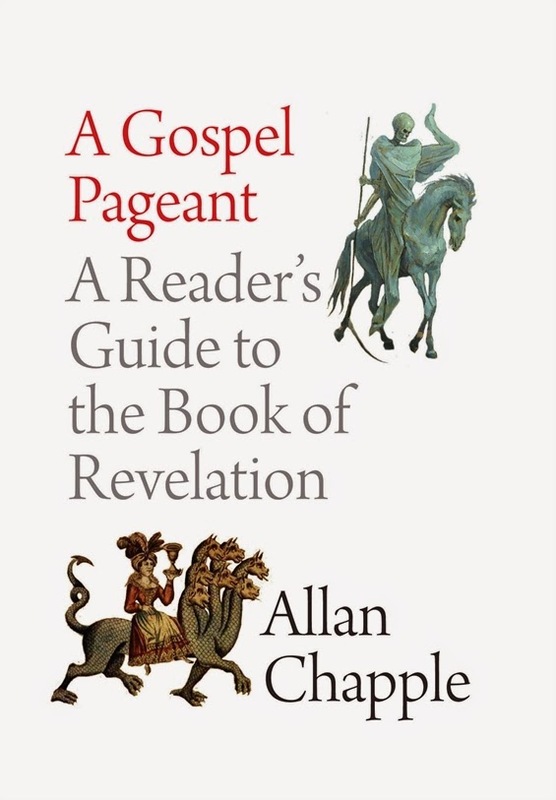 Allan Chapple is that teacher and his book A Gospel Pageant: A Reader's Guide to the Book of Revelation is one of those books of gold. WAIT!! STOP!!! DON'T GO AWAY!!! I haven't written a post in ages. Please stay. I know, I KNOW...Revelation. I know. Truly I do. But please don't click on that cross or swipe me aside. Really. And yet, I sympathise. After some bad teaching on Revelation (including bad, bad, BAD movies at the mid-week Bible study group) pretty early on in my Christian life I have been scarred for life. Even though I have since sat under some very good teaching on Revelation I cannot shake the knot that immediately forms in my stomach at the very mention of the book. Someone suggests we study Revelation in Bible study - inward groan. I get up to Revelation in my reading plan - oh no. A post comes up on Revelation - I am reaching for my mouse ready to move on to something else. I know. But this year Revelation did come up as a topic for mid-week Bible study. So this year I have taken A Gospel Pageant off the shelf to read. I've read it four times in the last few weeks. And I'm not finished with it yet. If you are after a sensible, thorough, consistent, thought-through and ultimately not-scary coverage of Revelation then this book is for you. It undoes our tendency to latch onto a particular part of Revelation without giving thought to the greater context - an approach which often ends up in a scary distorted interpretation. A Gospel Pageant is not about cracking codes and understanding the minutae of the book but about how to read Revelation as a coherent whole in all of its gloriousness and terribleness, reflecting the fact as learned from the rest of the Bible that the Last Day will be both terrible and glorious. A Gospel Pageant provides the tools for a confident reading of Revelation. As a result of reading this book alongside Revelation my view of Jesus has been magnified. I am encouraged and spurred on to strain towards heaven and flee from hell, to strive for godliness and scarper from sin. This book gives a well founded urgency to prayerful personal godliness, evangelism and discipleship. It is both instructive and pastoral. Unfortunately the scars of my poor introduction to Revelation run deep. I suspect I am not alone. I know that in a year's time I will get up to Revelation in my reading plan and my heart will sink again. It is a deep set default position which will mess with my memory and will mean that I won't retain all the details of this book. But at 85 eminently readable pages - the fruit of many years of teaching to finely hone the script - this will now remain my handy companion when I reach the last book of the Bible until such time as the old Revelation scars have healed. It is currently out of print but there are still a few copies floating around the Internet so I would say get yourself a copy while you still can, keep your eyes peeled for when the reprint happens or you could leave a comment here to go into a draw to win a copy - because as it happens I have a spare. Think of it as a reward for not clicking off this post when you read the word "Revelation" at the beginning and for persisting to the end. I'll draw out a winner at the end of next week. This world can be very daunting and discouraging for the believer. It can be fierce in its hostility and seductive in its duplicity. Either way, it can be difficult to resist. But John's vision of judgment tells us that evil does not have the last word. No matter how powerful and destructive it is, no matter how pervasive and successful it is, in the end sin will be overthrown. The kingdom of the world will not last (Rev 11:15). God will triumph. His kingdom will prevail. From A Gospel Pageant: A Reader's Guide to the Book of Revelation by Allan Chapple, page 69.